“Washington Canal Groundbreaking,” Histories of the National Mall, accessed April 22, 2019, http://mallhistory.org/items/show/341. On May 2, 1810, Washington officials and citizens flocked to the groundbreaking for the Washington Canal, which would connect the Potomac River to the Eastern Branch, also called the Anacostia River. Although the canal had been part of the original 1791 plan for the city, it had never been built. In 1809, Congress chartered a new company specifically to complete the Canal. 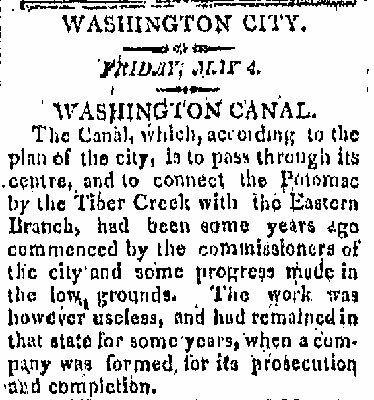 The National Intelligencer, one of the first newspapers in Washington, reported on the festivities for the groundbreaking of the canal, which people hoped would promote business in the city. The Canal, which, according to the plan of the city, is to pass through its centre, and to connect the Potomac by the Tiber Creek with the Eastern Branch, had been some years ago commenced by the commissioners of the city and some progress made in the low grounds. The work was however useless, and had remained in that state for some years, when a company was formed for its prosecution and completion. On Wednesday the 2d of May the operations of the company were begun. Invitations were given to the President of the U.S. and to the principal officers of government and of the city to attend the ceremony of opening the ground. About 2 o'clock, a numerous concourse of the citizens having assembled, the President of the U. States and his family arrived on the spot previously determined upon, near the Jersey Avenue. A Marque was pitched and refreshments provided. The line of the canal having been marked out by Mr. Latrobe, the engineer, the President of the U. S. was accompanied to the ground by the President and Directors of the company, and having received the spade from the hands of Mr. Caldwell, president of the company, he turned up the first sod—success to the undertaking was then drank amidst the acclamations of all present, and a sod having been dug by the President of the company, and the Mayor of the city, Mr. James Cochran, the undertaker of the work, followed with his plough, drawn by six stout horses, and cut a furrow ten inches in depth and eighteen in width, with a force rapidity that astonished all present. The work proceeded and a numerous concourse of citizens remained on the spot the whole of the rest of the day. Refreshments were provided in abundance, and a degree of cheerfulness and hilarity prevailed which has never been exceeded on any similar occasion.